People stroll along the waterfront admiring the luxury yachts docked at the Port Hercule marina in La Condamine near Monte Carlo, Monaco in France, Europe. 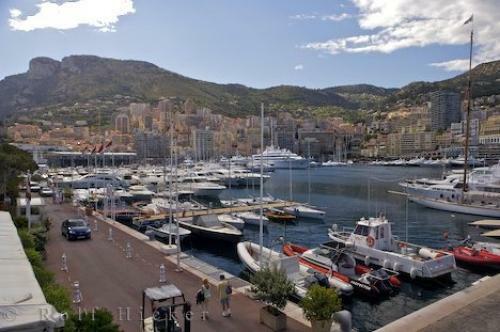 At the Port Hercule marina in La Condamine, Monaco in France, the view consists of luxury yachts and high class buildings of Monte Carlo that encircle the harbour. A stroll along the walk near the marina is where you can feast your eyes on some of the most incredible yachts that travel the world and come to Monte Carlo quite frequently. Photo of luxury yachts at Port Hercule marina near Monte Carlo in Monaco. ... Everything is within walking distance from the marina, so there is plenty of time to get a taste of the way the rich and famous spend their vacations.